Hello Campers and Camper Families! We are excited for Sophia Camp 2019, which will be held this year August 5-9 in Coronado. Please scroll through our website to learn about camp ethos and activities, and then click on Register For Camp 2019 Registration above to register. We look forward to being with your girls again this year. Our beloved Morgan Andersen dropped by Camp two days in a row to lead an activity that is always a favorite – making self-care products. This year the girls got to whip up a healthy sunscreen, an after-sun body oil, an edible strawberry face mask, and something Morgan called Rose Beauty Bath Bombs. Our campers made these as a present for their Mums, choosing from the essential oils of rose, lavender, neroli, and rose geranium to make them sumptuously fragrant. Peppermint, eucalyptus, vetiver would be good choices too. We like to remind our campers that nature is the best source of ingredients we put in and on our bodies. This recipe uses items you may have already in your pantry, except for citric acid which can be found usually at the grocers, walmart or craft stores. 1. Mix the dry ingredients together in a large bowl. Use the whisk to make sure the mixture is clump-free. 2. Mix up the wet ingredients in a separate small bowl. 3. Slowly add the liquid to the dry mixture, one teaspoon at a time. Whisk as you go, and slow down if it starts to get fizzy. You should end up with a mixture that just barely clumps together, like damp sand. 5. Place on a baking tray and leave in the refrigerator overnight. Wrap and gift, or pop one out and enjoy in your bath. We are excited for Camp starting Monday. Here is our list of items to bring + location for drop-off and pick-up. Below is our daily schedule so you can follow along and imagine the fun! Each day at camp, after our Lunch with Leaders series, Sophia Campers gather in a circle for creative time. One day we journal, one day we make self-care products from natural ingredients, and one favorite day we gather to paint with our beloved Marjorie MacKenzie. Marjorie has been teaching children and adults for 25 years and has traveled extensively to explore artists in different parts of the world. For example, she is just back from a trip to Spain where she discovered Spanish artist Joaquin Sorolla! Marjorie teaches directed drawing, watercolor, acrylic, collage and pottery, with a special love for color and mixing media like ink with watercolor and collage. Her passion is art history and mixed media. Our afternoons at camp with Marjorie are magical. She teaches us that anyone can draw or paint and everyone is an artist in some way. We are so honored to have her, and look forward to getting colorful with her this summer! To learn more about her art, or her individual and group classes, you can contact Marjorie at 619-990-1357. We are excited for Sophia Camp 2018, which will be held this year August 6-10 in Coronado. Please scroll through our website to learn about camp ethos and activities, and then click on Register For Camp 2018 Registration above to register. We look forward to being with your girls again this year. Thank you! In my wildest dreams, I’d never have imagined a week as great and as beautiful as this past week at Sophia Camp, with a group of girls as smart, creative, thoughtful, caring, wise and fun as our campers! We have been blessed with terrific memories, loving hearts, and fifteen fabulous new friends. We will treasure these moments forever. To give our families a taste of camp, our talented high school campers created this fun video. They also wrote the blog post below about our Lunch with Leaders series. Thank you all, again and again, for a fantastic week! We wish all our campers a great back-to-school season, and hope to see all of you again soon. Written by Sophia Camp junior counselors Teia and Amelia. Each day of camp, a different female leader would come to have lunch with the girls and give a talk about their career and their leadership story. For the first day, the guest leader was Karyn Buxman, a self-titled “neurohumourist” — studying the healing effects of humour on the brain. She spoke to the campers about her journey from being a nurse to her current profession, and how she maneuvered the sometimes tough decisions involved in that process. She explained how she is a leader in many different communities around America. After she had told her story, she taught the campers a laughter exercise, in which campers were encouraged to step out of their comfort zones. She taught the girls that laughing every day, even for ten minutes, can have a positive effect. On Tuesday, the girls were given the opportunity to hear from Dr. Silvia Mah, who is an angel investor. But what exactly is an angel investor? An angel investor is someone who invests in people (in Silvia’s case, specifically women) trying to start or continue growing a business. Along with that, Silvia is also a full-time mom of three (according to her, its four, including her husband) and a professor at UCSD. She spoke to the campers about being yourself and not worrying about everything. She encouraged the girls that it would all turn out well in the end and that they would end up where they were meant to be. Another featured leader this week was Dr. Heidi Hanna. She is an integrative neuroscientist who focuses on how nutrition and stress are connected and their effect on the brain. The girls learned so much from the many different leaders and their different perspectives. 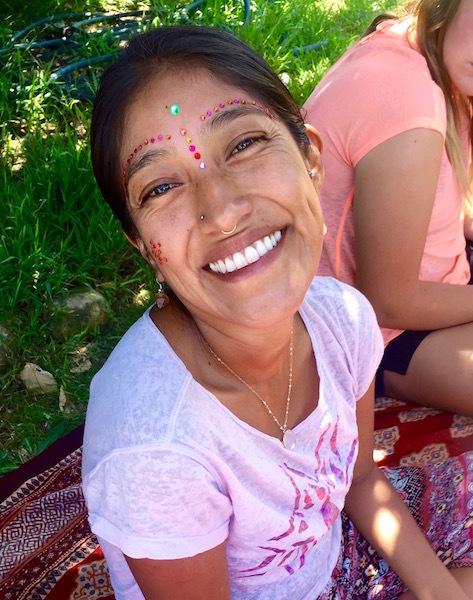 We were inspired by their leadership and awed by how often there were connections to the yoga and Ayurveda we had learned about during Sophia camp. A huge thank you to every leader who spent their lunchtime at camp this year! Our first two days of Camp have been awesome! Thank you Mickey and Dave Hanson for the beautiful garden and unexpected gift of the swim, and thank you campers for being such great people. You inspire us! Sophia Camp begins Monday and we have an amazing schedule, with the most inspiring array of radiant women delivering gifts, wisdom, practices and love. Parents are invited to join us for Lunch with Leaders or Morning Yoga. You can print out the schedule here: Sophia Camp 2017 Daily Schedule. We look forward to seeing our Campers Monday morning! she provides a road map for action.” ~ Howard Hunt, PhD. Joyce Chapman is a best-selling author, speaker, teacher, and professional and personal coach. A pioneer in the field of journal keeping she provides step-by-step journaling techniques for actualizing dreams to individuals, groups and companies through her books, newsletters, workshops, training programs, and coaching sessions. Joyce is known for her landmark books, and their companion workbooks: Journaling For Joy: Writing Your Way to Personal Growth and Freedom, Journaling For Joy~ The Workbook, Live Your Dream: Discover and Achieve Your Life Purpose, Live Your Dream Workbook, Celebrate Your Dream: Fulfill Your Destiny One Wish at a Time, Celebrate Your Dream Workbook, Notice and Journal, Notice! The Art Of Observation and Raising A Dreamer: How To Inspire And Guide Young Dreamers To Live A Dream-Centered Life. But what makes Joyce so special is the magical, inspiring, warm and loving way she connects with our campers. Joyce is like a warm hug for the soul. Our campers adore Joyce, and learn so much in the afternoon she spends with us. We are so honored to have her, and look forward to writing with her this summer!